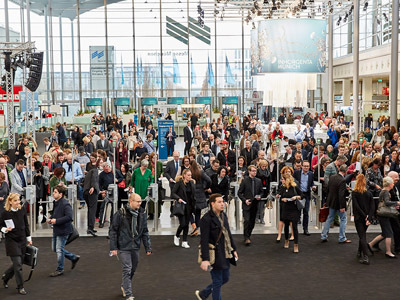 For four days, Inhorgenta Munich 2017 has been the International meeting place of the jewellery and watch industry. About 27,500 trade visitors from over 70 countries were in Munich from February 18 to 21 – these are five percent more than in 2016. As a highlight, the Inhorgenta Award celebrated its successful premiere. has risen by five percent to 27,500. The positive conclusion for this year’s edition has also prevailed among the exhibitors. The jewellery shows, at which models presented selected jewellery of the exhibitors on the catwalk, equally stirred up enthusiasm. On the first day of the trade show, they started with a fantastic opening before fully occupied seat rows. However, Inhorgenta Munich 2017 also offered abundant input for daily business in the jewellery and watch sector. This was guaranteed by the attractive Seminar Programme, one of the focal points of which was digitalization. As a highlight, Jeremy Abbett, Google evangelist over many years, gave a lecture on the ‘Store of the future’. Towards the end of the trade show, young professionals had the opportunity to become more closely acquainted with the industry through interesting workshops and lectures, and to get directly in touch with experts. The award ceremony for the ‘Golden Balance Wheel, in which Inhorgenta Munich participates for the first time as a partner, took place at the closing of the trade show on the evening of February 21. For nearly two decades, the readers of Uhren-Magazin, Watchtime.net, Focus and Focus Online have selected the ‘world’s best watches’ annually.